Greys And Melanomas; Is A New Vaccine The Answer? This article is the first in a series I will be writing about our decision to allow Oliver to participate in a Melanoma Vaccine trial. What follows documents the history of his melanoma. Just to give a little bit of background, bear with me. I think it’s important that you view the whole process leading up to the vaccine information. I breed my own horses to show. I don’t shop around and buy something to show, and I rarely sell what I have bred for myself. I breed it, raise it, train it (with help from my trainer) and show them. I am an amateur, I do not train horses for others. I rode a lot of track rejects with baggage and a lot of crazy project horses as a kid. When real life kicked in, I just decided I never wanted to buy another horse, and wonder what it had seen and done. So when my grey mare retired, she was incredibly athletic and had a fabulous brain, breeding her was a no brainer. Yes it’s a long process but I enjoy it, but there are no secrets or baggage. I’m there every step of the way. Do I have a thing for grey’s? 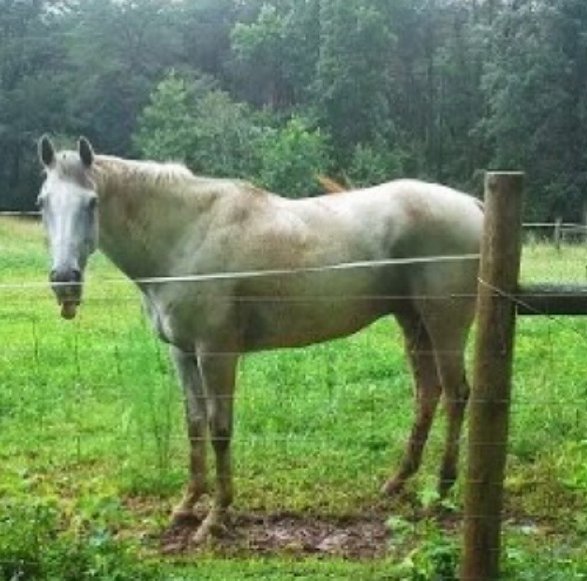 Possibly, as my friend Kristina says, there is NOTHING prettier then a clean grey horse. However, I admit, I am a total sucker for a toe flicking blood bay with chrome. That whole fire and ice look, the white, to black, to bay legs <3. But you can’t have EVERYTHING without writing a check that far exceeds my pay grade. Oliver’s sire, Audited ( now deceased) was grey and his dam, Catch The Irish (Ladybug) is also grey. 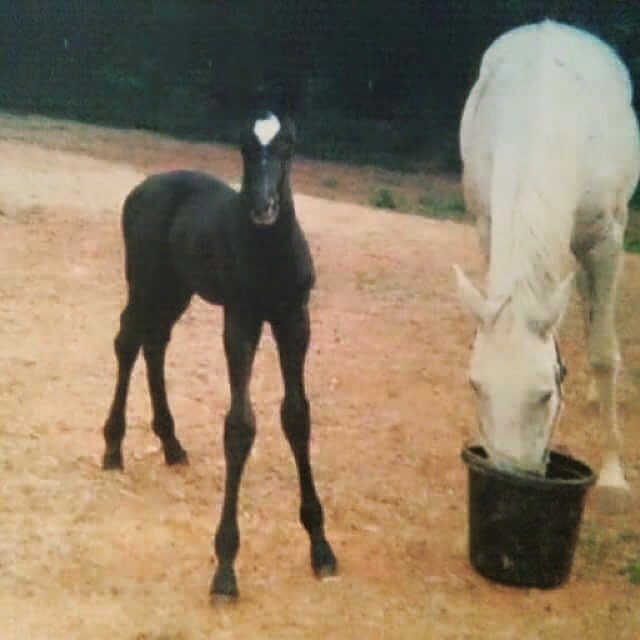 It doesn’t take a DNA genius to determine that the foals these two produce will likely be GREY. Oliver and his older full sister Emily were both born black and shed to grey. The only difference being Emily took about 9 years to turn grey, where Oliver was a dapple grey by the time he was 4. The summer Oliver turned 3 years old I noticed he had a strange patch of rough skin at the top of his croup. It seemed like a random patch of rain rot that simply would not resolve. I treated it with everything under the sun for months from both a veterinary and a holistic perspective. The only thing it seemed to do was make it sore, and eventually the fur turned white. I finally decided if it’s not broke don’t fix it. It wasn’t getting any bigger, it just wasn’t going away. Since I’d done everything else, chronic neglect seemed as good a treatment as any other I had already tried. I was slow to start Oliver, his body was ready but his brain had not quite caught up. We stuck to ground driving with tack and backing until he was 4. At which point he spent 30 days at a local professional for his ‘go button’. His spot grew with him, but it didn’t actually change shape. After 8 months of trying to ignore it, the fur seemed a little matted like it was weepy and it was a touch painful. I finally decided maybe I should take my Oster A5’s with the 40 (surgical) blades to it and see what on earth that spot is doing. The clip job revealed a raised rough patch of skin that had several little ‘volcanoes’ for lack of a professional description. A few of the volcanoes had erupted and spewed this nasty sticky black substance causing the matted hair. I won’t lie, it reminded me of the debris from a sheath cleaning. Not much of a smell, just looked awful and a bit painful. But Oliver didn’t seem to mind, or even notice it was there. In one way we figured out it was NOT a fungal or bacterial skin condition. In another way I was terrified and horrified. 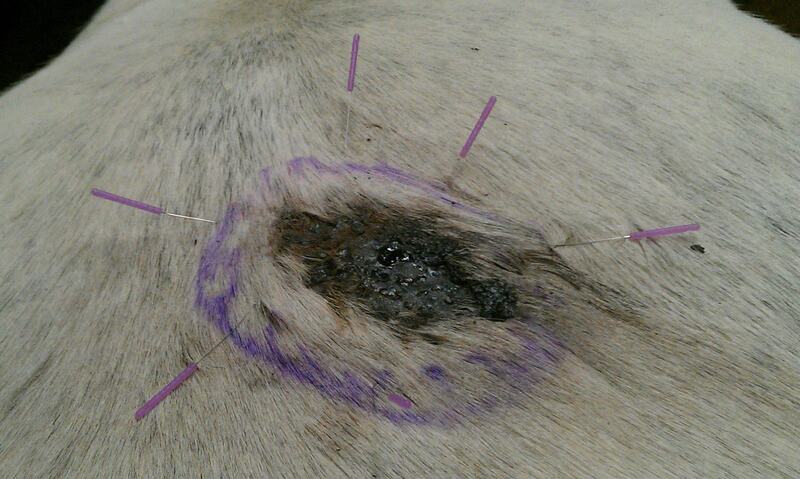 A few vet consults later and it was ruled a sarcoid based on how it was presenting. He certainly gets a carrot for creativity (Note Sarcasm). Given it’s location it is either exposed to bugs and debris from rolling in the warm months, or covered by a blanket in the cold months. It’s also very close to his spine, we were hesitant to biopsy it, and removal was strongly discouraged. We opted to manage the weepy episodes by keeping it clean and coating it with topical wound care using trial and error. It would be fairly quiet from late summer to late spring. But it would always seem to flair up in May or June. We tried prescription fluoride which in humans has shown some success, however again due to the location, after a brief trial we had to stop. Once the sun would hit the fluoride, apparently it would magnify the heat on the sarcoid, then run down the side of his rump and down his leg, causing a burn. We tried again in the winter, but the blanket seemed to create an incubator. In 2011 we tried acupuncture, which seemed helpful at settling the flair ups and making it a bit smaller in size. Oliver was not exactly thrilled with this treatment, but he did tolerate it without much complaint. We complimented the acupuncture with continuing to keeping it clean with dermal flush and alternating topical applications to keep bugs and debris out of it. One year, silver ointment that is used on burn victims seemed very helpful. The following year it was useless, but Panalog seemed to help. It was very frustrating for both of us because it went from being nothing, to something that radiated between being tender to the touch, to incredibly itchy. An itch he could reach so he often sat on the walls or fencing trying to itch it. ( I will write another blog on itching vs skin care on a grey- but this strictly related to his ‘volcanoes’ One week he would be in love with the fleece & sisal curry mit, couldn’t get enough, yes that’s the spot. Three weeks later, don’t touch it. Externally no changes, but obviously something was up. It was infuriating being unable to really help him without putting him through invasive procedures that in all likely hood would not change the course of treatment. Oliver never took a lame step, there was no reason to give him time off. When it would flare up I would clean it and treat it. Often covering it with baby powder, washing it off immediately after my last class of the day. We aren’t out there pounding it down every weekend so if it was really weepy we might skip a show. We ( my husband and I) decided that if he ever needed long term stall rest, or if the spot ever drastically erupted we would pursue the next step of having it biopsied. This went along well until this past summer. At the end of the spring circuit, we were finally getting it together in the lower A/O’s. Finding the distances, getting our changes, me staying out of his face in the corners, keeping him in front of my leg and not getting ahead of him. Finally! Back to our usual, find 7 our of 8 with a “mom your wrong I need to swap on the long approach to the single on the diagonal.” We took WCHR week off, my nerves were going to eat me alive with the influx of those who had just left Devon or Upperville. Either way he was due for a break. He lives on my farm, I tell folks they live like nags when we are at home, because that’s how they are happiest: horses living like horses. Don’t get me wrong, if the weather turns fierce they come in for their stalls. I turned him out for 2 weeks, not much jumping mostly light hacks. Right before the summer series kicked in, he came up from the pasture with his rump in high flair mode. I’d been watching it for a few days, as it seemed like it was getting ready to do something. It was crazy itchy, and a hard raised bump had started up in the middle of the problem area. This particular day, the bump was soft, sinking, slightly oozing and just smelled of necrosis. We took a road trip to the University Of Georgia College Of Veterinary Medicine located in Athens, Ga. on July 3. 2015 for a work up and biopsy. After viewing the photographic journal I’ve kept for the last 6 years, they were also at odds during the work up if it was a melanoma or a sarcoid. Sure he had some small melanomas, I’m used to those given his mother, and his sister. But neither of them ever had anything like this mass. After a full work up, I can somewhat rest at ease. Internally he is clean, externally a few in the normal places, a few under his tail. Clean on the scope, the abdominal ultrasound and the rectal exam. They ultra sounded his angry croup mass, it was not very deep, a mere 1.5 cm. They took 2 biopsies and sent us home with discharge instructions leaning heavily toward a melanoma diagnosis after removing the biopsies. Okay, so it’s probably a melanoma, now what? Mischievous DIY A/O Rider with a tacky addiction and a love of raising foals into show horses. Horse whitening extraordinaire, firm believer in horsemanship first, before points ribbons & trophies.